It’s not a bird. It’s not a plane. It’s a McLaren! 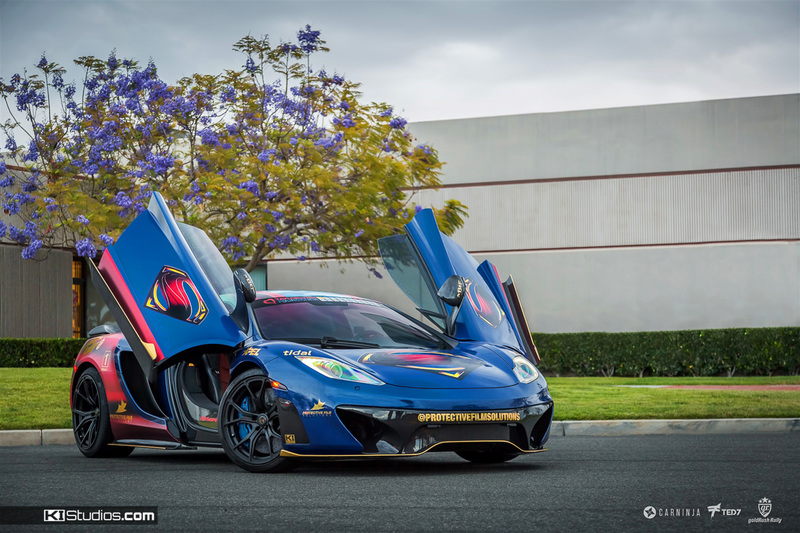 Supercars and Super Heroes make a perfect pair. Anyone can put a bat logo on a black car… but representing the man of steel with iconic blue, red, and gold is a challenge. We sprang into action on creating this sleek style of elegance. Showcasing a symbol of hope on the hood wasn’t enough, so Superman’s logo was also added to the doors. Doors up and ready to fly up, up, and away! Not bullet resistant, but deflecting everything from dust and dirt to rocks and gravel. This car is ready for anything that comes its way. Protective Film Solutions provided safety from any harsh environment this car may have experienced. Desert temperatures like heat vision during the day or freeze breath at night, the McLaren defeated all enemies in its way. A clear path ahead, gas petal to the floor, this McLaren 12C was flying into the action of an awesome rally in goldRush Rally 2016. Red cape flowing in the wind, not a hair or sponsor out of place, gold beautifully contrasting on blue and red. This car looks like it was taken straight out of a childhood dream videogame, imagination, or maybe even nostalgic Hot Wheels toy. Going back to humbling roots, even Clark Kent doesn’t need glasses to see the clarity and attention to detail. This clean look is out of this world that some may say it’s alien. While Superman’s muscle bulge through the blue of his costume, the roar of the engine can be hear and seen in the horsepower as this McLaren fly’s down the freeway. Not even kryptonite can slow this superman supercar down. Designed at KI Studios in San Diego, but installed at Protective Film Solutions in Orange County.